At eighteen, Jaele’s life is shattered when her family is murdered by a band of Raiders, members of a long-accursed race. Overwhelmed by rage and grief, alone for the first time in her life, and fuelled by childhood myths of a warrior queen, Jaele sets out on an epic quest for vengeance. Her journey takes Jaele through a kaleidoscope of cultures, some compassionate, some fierce, all remarkably fantastic yet potently real. As she makes her difficult way, Jaele sheds her innocence, but none of her experiences can prepare her for her ultimate confrontation with her enemy. With lyricism and imaginative power, A Telling of Stars explores the nature of love, grief and mourning. In Jaele, first-time novelist Caitlin Sweet has created a passionate, immensely affecting heroine. Jaele follows her heart, sometimes bravely, sometimes foolishly, and in the course of her quest, attains a difficult and liberating wisdom. 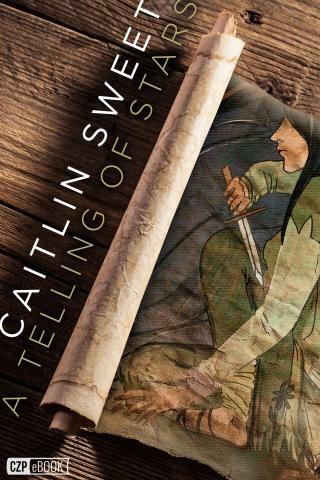 Caitlin Sweet’s first novel, A Telling of Stars, takes a number of conventional fantasy expectations and turns them on their heads, in the process telling a quest tale that has the feel of an ancient folk lay. It’s a fine, intensely sensual novel, the writing full of keenly observed sense perceptions and shifting emotions. It’s a feminine epic, and part of its power is the way it proves that term no oxymoron. Like many epic quest stories, it begins in the protagonist’s childhood and follows her through her growing pains. But here the pains come all at once and propel her on a journey terribly unlike those most quest fantasies offer.